I thought I’d do a sweet post today in celebration of my blogiversary. This is my first brown butter recipe. I’ve been seeing a lot of brown butter recipes out there and thought I’d do one myself. 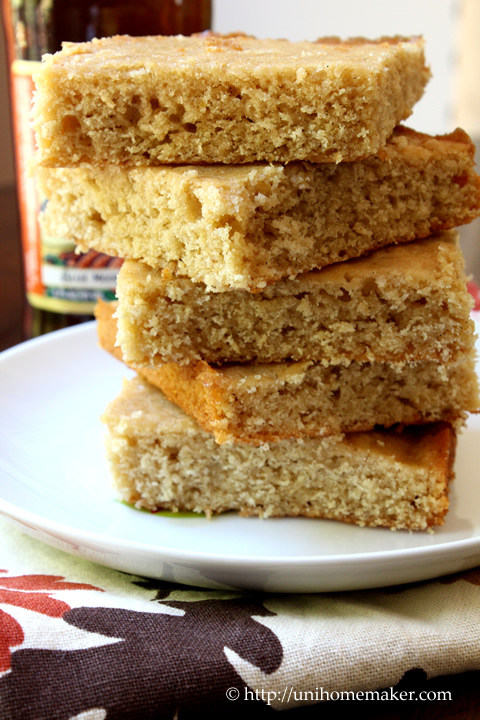 This isn’t your usual type of blondies. It’s not overly sweet and dense like the ones I’m used to. 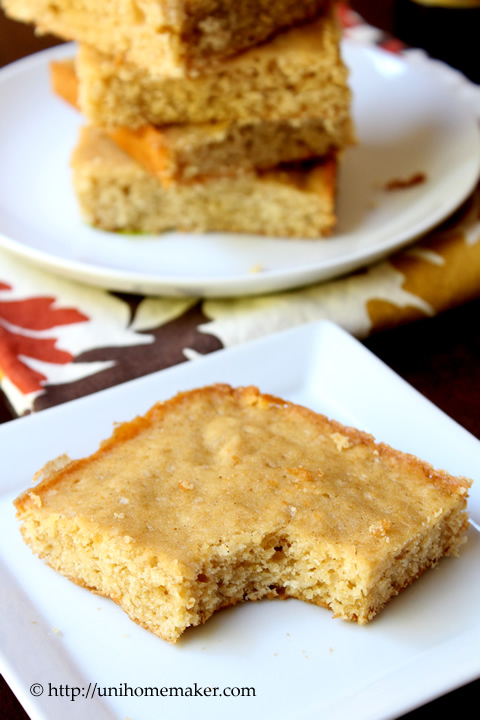 It has a lovely pumpkin-y and nutty flavor from the brown butter. It’s sweet enough as an after-dinner treat, but not overly sweet for breakfast in the morning with your coffee, yum! Happy 1 year Uni Homemaker! In a small sauce pan over medium heat, brown butter and stir occasionally. Once browned, remove from heat immediately. Keep in mind that once you remove butter from heat, it will continue to brown while it continues to cook. Keep a close eye on the butter, as it can burn quickly. Set aside and let the brown butter cool. In a medium bowl mix together flour, baking powder and salt; set aside. 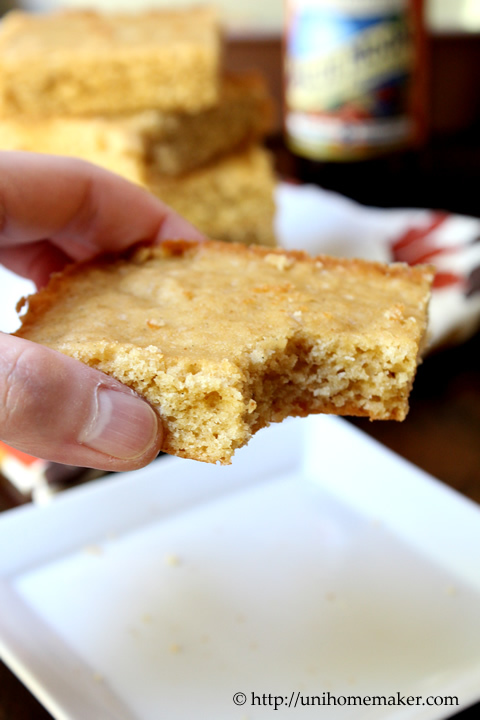 Using a stand or electric mixer (or mix by hand) mix brown butter and sugars until combined. Beat in eggs and vanilla paste. Then add flour mixture to the butter mixture a little at a time alternating with the pumpkin ale. Pour batter into the prepared pan, using your spatula to distribute the batter evenly. Bake for 25-30 minutes (rotating once halfway through) or until toothpick/tester inserted into the center comes out clean. Let the blondies cool completely before cutting. Yay! Happy first blogiversary!!! It’s exciting and and I love the blondies you shared on this special occasion. I tried brown butter for the first time this year and the smell and the taste of brown butter is VERY addicting. Now that I remember it I started craving!! 😉 Looking forward to your more of your posts this year! Happy 1 year Anne! I can’t believe you’ve only been blogging a year – you’re such a pro! Your blondies are calling my name! I am so ready to do some baking with pumpkin. They sound perfect with brown butter. Happy blogiversary! This is my first visit to your site and I’ll definitely be back for more! 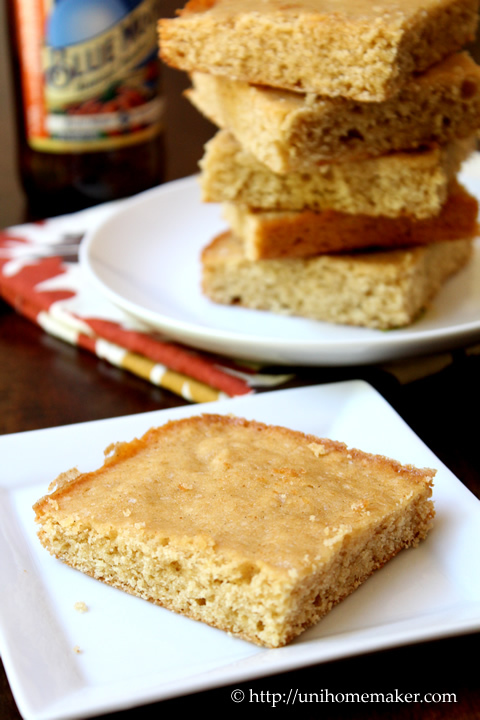 These blondies look great and I’m looking forward to pumpkin season. Happy Anniversary Anne! Glad to be a follower of your awesome blog! Happy Anniversary! These look delicious!! E and I are so happy for you. Hope you enjoy your days off, and we hope to see you guys soon, ciao. 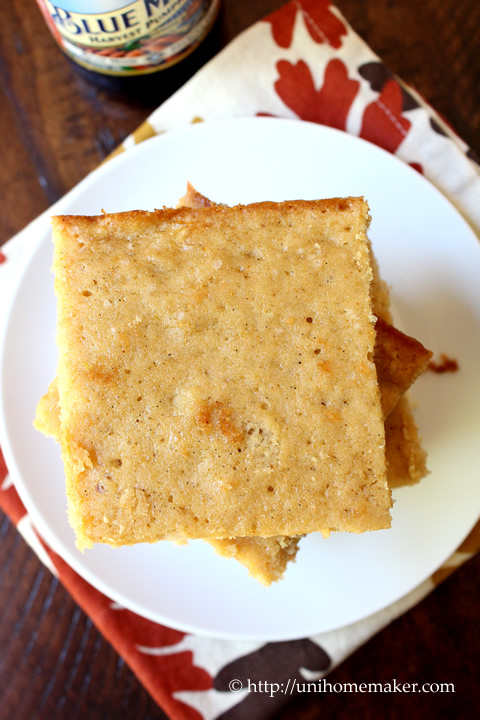 These pumpkin ale spiked brown butter blondies sound like the perfect way to toast in this special milestone occasion 🙂 Yum!